"This is a vital necessity," comments Pastor Leonel Lozano, the president of the Adventist church in Ecuador. "While religious freedom is guaranteed in the constitution, there are still many inequalities in the way religious groups are treated. We need a well-organized association that will take up the cause of religious freedom for all members of society." Participating in the January 27 initial consultations was Dr Jonathan Gallagher, deputy secretary general of the International Religious Liberty Association. He agrees with the assessment, adding that "we can bring to the country the expertise developed in the international community. We are here to help the development of a better atmosphere towards religious freedom and human rights." 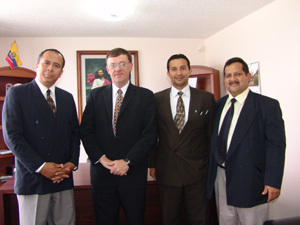 In the fist stages of the the new association, the planning group will be led by Dr. Winsther Miranda, a lawyer and legal advisor to the Adventist Church in Ecuador.